Kom og prøv de nye Boulder faciliteter i Esbjerg. Både voksne og børn fra 3 år (med en voksen) er velkomne. 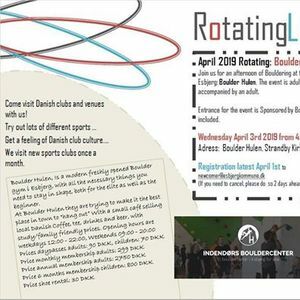 Adgangen for tilflyttere bliver til dette event sponseret af Boulder Hulen, inkl. Skoleje. Husk at tilmelde dig via dGlsZmx5dHRlciB8IGVzYmplcmdrb21tdW5lICEgZGs=. Try out Bouldering at the New Venue in Esbjerg: Boulder Hulen - along with a group of Newcomers. Once a month we visit a Danish club to learn about club life and club culture. This time both adults and children from the age of 3 (accompanied by an adult) are welcome. 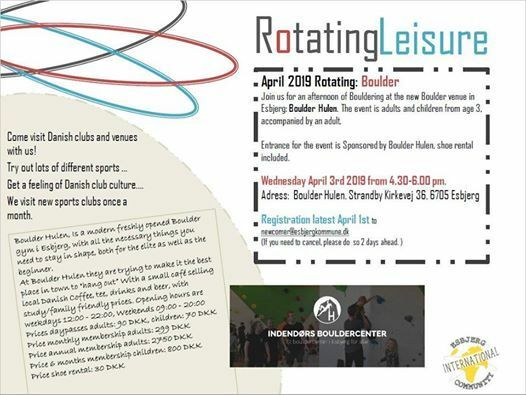 The event is sponsored by Boulder Hulen and is therefore free for newcomers.